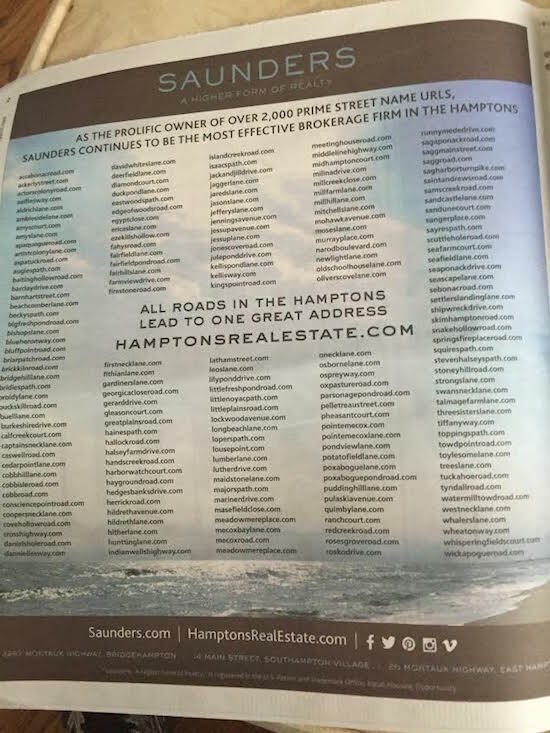 As you can see, Saunders is sharing that it owns over 2,000 street name domain names focused on the Hamptons. The paid advertisement was found on the inside cover of today’s (Saturday) New York Post, one of the largest newspapers by circulation in the US. I am unsure if this advertisement was found in all editions of the NY Post or the local edition. The NYPost has a circulation of over 720,000. I visited several of the domain names listed in the advertisement, and it looks like they forward to HamptonsRealEstate.com. This makes sense given the messaging within the advertisement, “All roads in the Hamptons lead to one great address HamptonsRealEstate.com.” If you visit Saunders.com, you are also forwarded to HamptonsRealEstate.com. One thing you will notice is that all of the domain names in the advertisement are .com domain names. Interestingly, HamptonsRealEstate.com was reportedly acquired for $100,000. The sale is not indexed in NameBio, and I am not sure if the sale was independently confirmed by any of the websites that track domain name sales. HamptonsRealEstate.com is a great domain name, and it is neat to see how this real estate brokerage is utilizing other domain names in its marketing strategy. Thank you to Gregg Freeman from Domain Capital for sharing this with me. I don’t think sellers are going to care about this and I doubt it is going to help them sell property either. Probably a 20k yearly expense they could do without. Values of individual domains is not what is important her. What is, is the fact that the readers from “all walks of life” are hit with a large list of Domain Names! A huge exposure for our industry, with somebody else paying for it. HamptonsRealEstate.com is killer and all they need, especially for the region and market. The other ~2,000 is a distracting waste. But sure, perhaps an article and collection like that is a little good for the digital real estate industry. WOW !!! Brings back memories. When I was a newbie 14 yrs ago, I made the same mistake. Fortunately, I only made that mistake with a couple hundred domains. I wish I could do a “do over”. Look for these domains to drop over the next couple years. Agree with many commenters here, although John hit the nail on the head. HamptonsRealEstate.com is a category killer, the rest is nonsense given legitimate SEO practices for the roads & communities on the primary site and traditional sustained print ad support / direct mail / trademark / magazine entitled “Hamptons Real Estate” with certified distribution. The valuation of these domains does not follow straightforward domain investor logic. These are street names, and from my understanding they host premium real estate properties. The forwarding of these domains to the Hampton’s lander won’t reap any SEO benefits whatsoever. Also noticed that they have registered specific addresses as domains, that better demonstrate what they are trying to do: 1006springsfireplaceroad.com and 106halseylane.com both resolve. Right or wrong, it’s good to see someone taking a swing at using a domain name strategy for their business. How we view the ad is of little importance, imo. Will someone who owns one of the many 10-30 million dollar homes in the area be impressed enough to list with them? If so, a sales commission in the neighborhood of 300-900k on one sale could be generated & we are then talking about what a genius marketing move this is. @Ian-Your comment has merit, and the only reason to register if you own the category killer is defense IMHO. Demographics for a home and seller you describe likely skews away from computer use to locate an agent and more likely towards a personal relationship with an established agent. The barrier to entry in real estate is time as an agent, numbet of similar homes bought and sold, years of marketing brokerage and agent, and relationships established and maintained, to name a few. Domain names and websites reinforce the perception of the agent, and occasionally produce listings and buyers. Most leads from sites are junk in my experience. Agree it’s nice to have them working the domain angle. The average sale price in the area is $2million, so they are unlikely to see many commissions of that size. @Snoopy I wasn’t talking averages but I do appreciate your point. Fwiw, Sagaponack (within Southampton) was listed as the most expensive Zip Code in the US not long ago. Median price was 8 million or so a year or two ago, I believe it is around 5.5 now. There are approximately 50 properties in that area alone that are currently listed for between 10-100 million. I should note that I’m not defending their 2000 street name domains. However, if their ad and domain spending helps them generate a nice sale, be it 2 million or 100, it could be a profitable and creative way to use those domains. Crappy or not. Nice to see the exposure for sure, as far as keeping a address specific or street specific name dot com after the home has sold, meh. The commish was huge, flaunting those names is like advertisement in itself, we own these because we did business here. When you factor the carrying cost it likely still makes sense, had a hard time admitting this all to myself but I have to be honest here. From the early inception of domain names, people rightly compared them to virtual real estate. And this is the biggest example I’ve seen of Virtual Real Estate working in tandem to sell actual Real Estate. Like the others have already mentioned, This is way too many domains especially since the company already owns the category killer for real estate the area. These domains maybe worthless (and no one would’ve known about them) if he did not pull the stunt of actually advertising it and bragging about it. It’s like a guerrilla marketing stunt, If he does indeed convince just a few of the higher priced property owners to list with him, it would all be worth it. The bragging stunt was more of a key to this than the domains.